Stock # UF150075, Gas/Ethanol V8 6.0L/366, Automatic, 120377 mi. CARFAX 1-Owner. LTZ trim. PRICED TO MOVE $3,500 below NADA Retail! 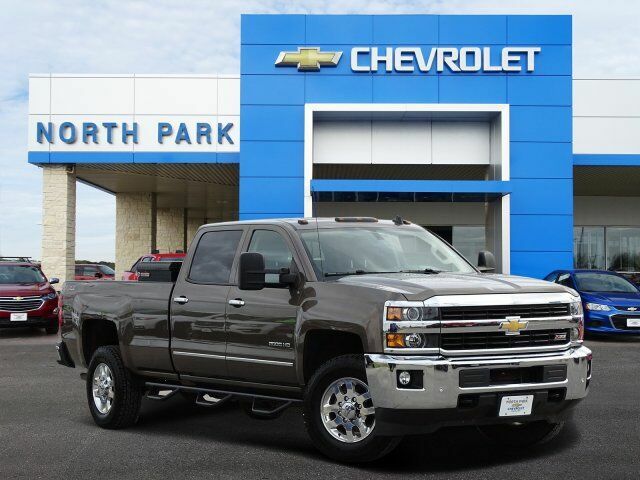 Heated Leather Seats, Bed Liner, Trailer Hitch, SEATS, HEATED AND COOLED, DRIVER AND FRONT PASSENGER FRONT BUCKET, Chrome Wheels, CD Player, Back-Up Camera, 4x4 AND MORE! 4x4, Back-Up Camera, CD Player. SEATS, HEATED AND COOLED, DRIVER AND FRONT PASSENGER FRONT BUCKET, BED LINER, SPRAY-ON Pickup box bed liner with bowtie logo consisting of high pressure, chemically bonded, sprayed-on polyurea & polyurethane liner formulation. Liner is permanently bonded to the truck bed providing a water tight seal. The textured, non-skid surface is black in color and robotically applied to yield consistent 90 mil floor and tailgate thickness along with 50 mil box sidewall thickness. Spray-on liner covers entire bed interior surface below side rails, including tailgate, front box top rail, gage hole plugs and lower tie down loops. FRONT AND REAR PARK ASSIST, ULTRASONIC, SEATS, FRONT FULL-FEATURE LEATHER-APPOINTED BUCKET with (KA1) heated seat cushions and seat backs. Includes 10-way power driver and front passenger seat adjusters, including 2-way power lumbar control, 2-position driver memory, adjustable head restraints, (D07) floor console and storage pockets. CHEVROLET MYLINK AUDIO SYSTEM, 8" DIAGONAL COLOR TOUCH WITH AM/FM/SIRIUSXM, USB PORTS auxiliary jack Privacy Glass, Keyless Entry, Steering Wheel Controls, Alarm, Heated Mirrors, Electronic Stability Control, Electrochromic rearview mirror. Wheels, 18" (45.7 cm) forged polished aluminum includes 18" x 8" (45.7 cm x 20.3 cm) steel spare wheel. Spare not included with (ZW9) pickup box delete unless a spare tire is ordered. BED LINER, SPRAY-ON Pickup box bed liner consisting of high pressure, chemically bonded, sprayed-on polyurea & polyurethane liner formulation. Liner is permanently bonded to the truck bed providing a water tight seal. The textured, non-skid surface is black in color and robotically applied to yield consistent 90 mil floor and tailgate thickness along with 50 mil box sidewall thickness. Spray-on liner covers entire bed interior surface below side rails, including tailgate, front box top rail, gage hole plugs and lower tie down loops.